This Thanksgiving, I decided to change things up just a tiny bit. Since the dressing is Brad's very favorite dish during the holidays, I always make this Classic Cornbread Dressing with Sausage, which is his VERY favorite. The holiday just wouldn't be complete with it, and I'd have A LOT of explaining to do if I didn't make it for him...hah. I needed to make extra dressing this year to take to family gatherings, so I thought it might be a good opportunity to try something new. Our local Fox station has just recently started a brand-new cooking segment on the morning news show, where they feature a local chef whipping up a fabulous dish. They even unveiled a beautiful new kitchen to use on the show. 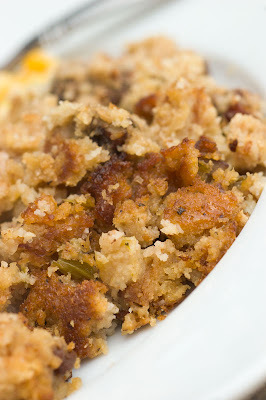 One morning before Thanksgiving, Chef Chris Zapalowski from Homewood Gourmet made this Apple-Pecan Cornbread Dressing, and my mouth my drooling by the time the segment was over. I knew then that this dish would grace our Thanksgiving table. You can see the video of Chef Zapalowski making this dish HERE! I'm so glad that I tried something new. The sauteed apples that are added to the traditional onions and celery mixture really kicks things up a notch and adds such a wonderfully sweet flavor to the entire dish. 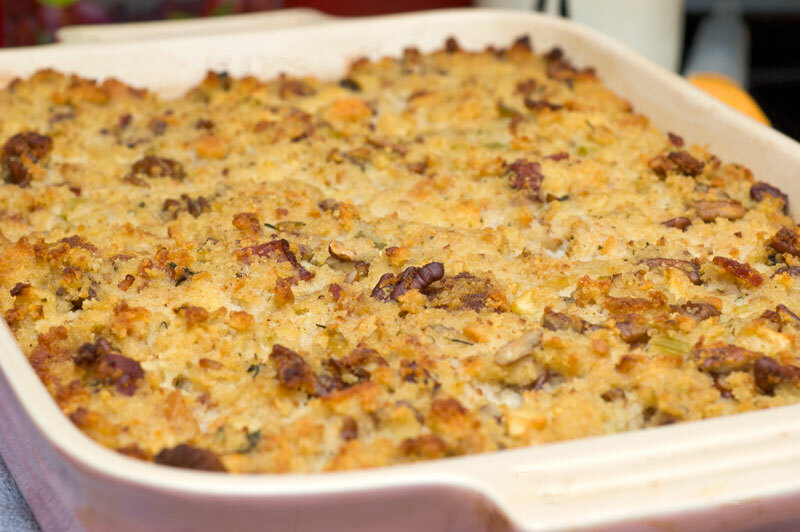 The bacon and toasted pecans just go one step further to make this an incredible recipe that will surely be added to my regular holiday rotation. Place ½ cup butter in a 9 x 13-inch baking pan; heat in oven at 425° for 4 minutes. Combine cornmeal, flour, baking powder, and salt in a large bowl; whisk in eggs and buttermilk. Pour hot butter into batter, stirring until blended. Pour batter back into 9 x 13-inch pan. Bake at 425°F for 30 minutes or until golden brown. Transfer cornbread to a cooling rack and cool completely. Crumble cooled cornbread into a large bowl and set aside. Reduce oven to 350°F. Heat oil in a large skillet over medium heat. Add bacon and cook, 8 to 10 minutes or until crispy. Remove bacon with a slotted spoon, cool slightly, chop and set aside. Add onion, celery and apples to the skillet and sauté 1 minute. Add garlic and thyme and continue cooking for 5 minutes or until vegetables are softened. Spoon onion mixture into bowl with cornbread crumbles. Stir in sage, salt, pepper, cayenne, pecans, and reserved bacon. Whisk together broth, butter, and eggs and pour over cornbread mixture, tossing until well moistened. Spoon dressing into a lightly greased 11 x 15-inch (about 5 quart) baking dish and bake covered at 350°F for 30 to 35 minutes. Uncover and cook and additional 10 minutes or until golden brown and cooked through. Serve hot.